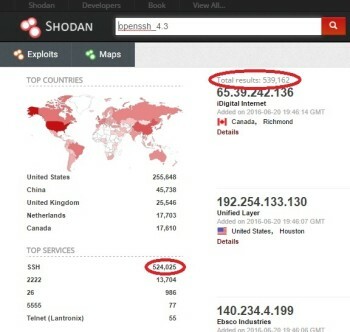 Shodan search results show that over half a million devices use the 10-year-old OpenSSH 4.3 software. This puts all these devices at risk. One doesn’t have to look too far to realize how vulnerable the Internet of Things (IoT) can be. It just takes a quick search on IoT search engines like BullGuard and Shodan.io. 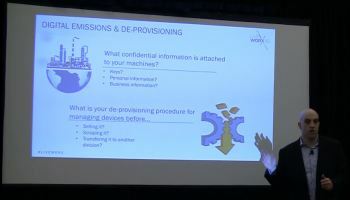 During a presentation at PTC LiveWorx 2016, Rob Black, senior director of product management at PTC, outlined how black hat hackers could get into over half a million connected devices using an old software known as OpenSSH 4.3. OpenSSH is a secure shell (SSH) protocol used to allow users access to networks from a remote location. It’s harmless, even useful, if used by the right user in a controlled way. Unfortunately, a popular version of the software, OpenSSH 4.3, has been out for about a decade. As a result, it has developed a laundry list of vulnerabilities that hackers can use to gain access to systems. According to the Shodan IoT device search engine, over half a million devices on the ‘net still use this outdated software. The scary thing is that Black explained that some search results will bring up IoT devices associated with power plants and wind tunnels. According to AdaptiveMobile, a mobile network security company, up to 80 percent of connected devices on the IoT do not have the security measures they need to protect us. Once you find a device on Shodan, you can see many characteristics on that device which will help hackers get into it. These attacks can even prove deadly depending on the IoT application. Take an integrated clinical environment (ICE) like an IoT-enabled hospital. Without proper security, many types of attacks have the potential to risk lives. 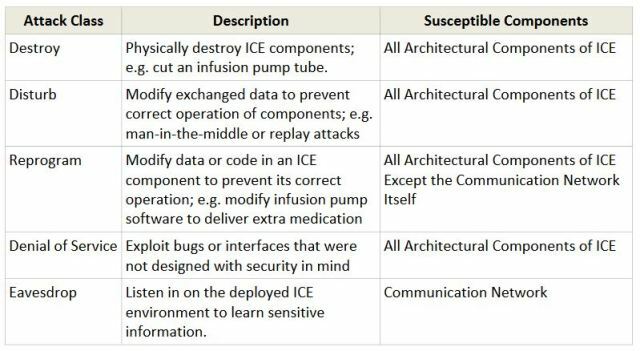 According to a report published by the Industrial Internet Consortium, these attacks fall into five categories. Engineers are designing these IoT devices, sensors and edge points. To ensure that hackers are kept at bay, these engineers need to understand and learn from their software engineer and IT cousins. How Do IoT and Cloud Security Differ? Black explained that unlike in cloud security, humans may not be in the loop when it comes to IoT security. It’s not feasible for millions of users to be there to hit “Okay” to update software in billions of devices. An engineer might think that as long as the cloud system utilized by the IoT device is secure, then all is well. However, there are differences between an IoT system and a cloud system. Black explained that on the cloud, users and applications are both managed. There are security tools and permissions put into place. On the operations side, servers will be secured and ports will be closed and audited. This takes a lot of testing, but it’s been done before. IoT security, on the other hand, adds complexity. IoT has a stronger potential for damage as water mains can be shut off, power plants can become critical and cars made unresponsive on the road. IoT has a diverse number of devices, operating systems and protocols making it hard to consolidate and standardize as companies grow and products change. Human interactions with all the devices is not scalable. For instance, humans many not be there to hit “Okay” for an update. The key is to work together. Engineers and IT professionals need to demolish their silos and learn from one another to make the IoT ecosystem secure. However, just because the IT crew has the ecosystem covered on the cloud doesn’t mean the devices and sensors are secure. Black demonstrating an IoT security architecture. With current IoT trends, if your device isn’t connected to the Internet, it soon will be. Otherwise, it will not keep up with the 30 billion other connected devices Gartner expects to see in the market by 2020. So the question may not be whether to get into the IoT market given all the security risks. It should be a question of how to manage connected devices with all these security risks. Black demonstrated what a simple IoT architecture might look like. 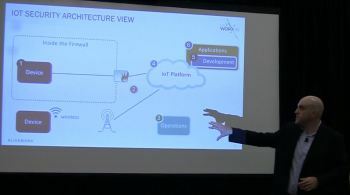 It includes devices within a firewall, wireless devices outside the firewall and having those devices connecting into the IoT platform. Then, all of this will be used in an application that will use the data from the devices to perform a function. All of these systems, applications and development tools used to make the system must be made secure. The issue is that because all of these different systems are under the control of various organizations on the vendor, customer and public levels, it can be confusing to establish who is really responsible for all of this IoT security. Given all of the organizations and users that might be associated with one IoT system, defining roles for these organizations and users is of high importance. Each user and organization will have different roles, which will define levels of control over the IoT system. For instance, you don’t want to give your customers visibility into and control over all of the IoT devices on your ecosystem. This could make the data of your other customers insecure, as competitors might gain insights due to the information on your system and the lack of roles governing the system. However, a maintenance team that services all the devices sent to customers will need to see which devices from each customer will be up for servicing. The key takeaway is that as your system grows on the IoT, much of this role management should be automated. Otherwise, the role management will not scale with the IoT system if a human remains in the role assignment loop. The division of permissions shouldn’t just be between roles. It should also be between systems within the IoT device itself. Engineers must design some systems and subsystems to be independent and separate from all other systems. This will ensure that if a hacker compromises your device, they will not be able to take control of key systems. After all, there is no reason for an entertainment system in a car to be linked to the steering, brakes and accelerator of a car. As the WIRED video below shows, though, this was the case with the Jeep Cherokee. As a result, hackers were able to mess with one reporter’s drive on the highway with hilarious outcomes—but the joke isn’t funny anymore if people actually get hurt. Eric van Gemeren, vice president of R&D at Flowserve, explained that the automobile industry and other IoT device creators can learn a lot from the process industry on the separation of systems within a design. In other words, van Gemeren explained that if a safety system like fire suspension sprinklers were installed in a process plant, they will need to be on an isolated system. Do Your Devices Need to Talk to Other Devices? When people think about the IoT, many of them think of connected devices communicating with each other over the Internet. Though there are situations when the data should be sent to the cloud, there are also situations where it is faster and more efficient for devices to talk to each other directly. “You could go up to the cloud and negotiate up there and bring it back down but that is not using bandwidth efficiently and what happens if you lose network connectivity? Will your devices fail? Do you want them to be dependent on the network?” asked Black. 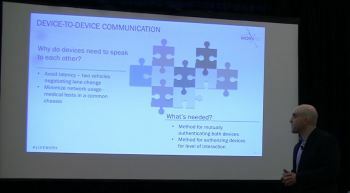 When connected device need to talk directly, you will need a way to authenticate the devices mutually as well as a method of authorizing the devices to an appropriate level of interactions. “It doesn’t make sense for one car to have the authorization to turn on the windshield wipers for another car,” joked Black. This brings us to another key step in setting up a secure IoT system: ensuring your processes can set up provisioning and approval for device-to-device communication, data ownership, de-provisioning and more. Unfortunately, you can’t just let all devices interconnect without a provisioning and approval process either. Take the Superfish scandal, for example. The program was intended to provide advertisers with a way to show ads based on a user’s Internet searches. This sounds innocuous enough until you realize that, at the time, all Lenovo laptops had the same self-signed certification key for all the laptops that shipped out with the program. This allowed for man-in-the-middle hacking attacks that could intercept the Internet communications of any Lenovo laptop with the Superfish program still installed. One method Black suggested to get your devices onto your IoT system with secure provisioning and approval is to use your enterprise resource planning (ERP) system. If your ERP system were connected to the IoT system, then the provisioning and approval process will expect to see the device. Not only would this system be secure, it can also be made scalable as there will be no need to have a human in the loop. Black explained the importance of factory resets and de-provisioning when selling used devices. There is a lot of confidential information that can be stored on a connected device. Therefore, if users aren’t careful, they could be giving a hacker everything they need to get into the system when re-selling these devices. The average user would know enough to delete their personal and business data from the device, but there still might be information on the re-sold device that can open doors to hackers. For instance, the device might store digital keys that were used to encrypt the data you were sending and receiving from the Internet. If you were to sell that equipment without changing those keys, then whomever you sold that equipment to could now be able to decrypt all of the data you sent and received while operating the device. Assuming the hacker intercepted that data in full knowledge that you were to sell the equipment, they now have gathered a lot of information on your personal or business operations. As a result, engineers should design easy to use de-provisioning procedures for the users of their devices. Whose Data Is It Anyway? Where the Contract’s Made Up and Protection Should Matter. Black asked the question: Whose data is it anyway? One point of contention for the development of IoT security is the question of who owns the data. Is it the device manufacturer, systems operator, device operator or the maintenance operator? Will the answer be dependent on the IoT device application? These questions need answers if robust security measures are to be put into place. Otherwise, the right information might end up in the wrong hands. It appears that though 54 percent of surveyed consumers might be comfortable sharing their data with companies, the reverse is not always true. Alternatively, Black used an example of a medical device company. If the company is sold, then it makes sense for whomever buys the company to also own the data. After all, it will, in theory, be using said data to service the same clients. It isn’t in the client’s interest for the data to start at point zero. However, does the answer of selling data ownership change with the scenario? What if, instead of a company being sold, it’s a house? Who owns all the data of the smart home—the previous tenants or the incoming tenants? It might be useful for the new tenants to know the power usage history of the house so they can budget their expenses, but do you want strangers to have data like that? Before security walls are put up for an IoT device, these questions must be answered. Otherwise, an owner of the data might be cut off from their property. This can lead to some serious legal ramifications. On the other hand, not understanding where the line in the sand is for data can also open up security risks. “If there was one single challenge that people are concerned about and has slowed IoT deployments is the question of security and integrating security solutions all over that technology stack. It is one of the bigger challenges,” said Pendergast. However, one solutions to the IoT data question may not lie with the engineers, programmers or designers. It might be in the hands of public relations educating the public about IoT security and what data is and isn’t being collected. Reducing IoT Attack Surfaces: Do You Need Access to the Open Web? Shodan is only able to show the IoT devices that are on the open web. The number, as well as types, of devices that it can find is certainly scary. Does your device need to be on the open web? Do multiple surfaces of attack need to exist? The answer is no—not if engineers design the device to be the one to initiate communications. In other words, the device won’t be generally available on the Internet. If your device can connect to any endpoint on the Internet, then any hacker at any location could in theory send a command to that device. However, if the device is connected only to one server via a device-initiated communication, then only that server can send commands. The theory is that your server will be within internal IT infrastructures and securities. However, there is a downside to device-initiated connectivity. You will have to rely on the device to connect to the system in order to initiate an update or collect data. In other words, you can lose connections to the device as soon as a customer changes firewall securities or the network is interrupted. As a result, if engineers chooses to use device-initiated connections for an IoT system, then they will need to inform the customer. The customer will need to understand if the firewall and network connection isn’t interfering with the connection. The longer your device is in the real world, the more likely it is that a vulnerability will be found. As a result, engineers will need to design software update compatibility into their devices.